WOW, I can't believe I've reached 100 followers on GFC. Thank you so much everybody! I think its only fair I offer you something in return for your enthusiasm and loyalty. This is my 100 Follower MAC Giveaway! Being in the beauty blogging industry can be hard on our bank balances, and I know when I first started out, I had a few MAC items, a small collection Bobbi Brown and of course a Benefit Benetint. But, that was as far as my high end products stretched. Seeing people blog daily about new MAC purchases made me want to spend my entire pay check on high end products which certainly isn't a good thing for a student! 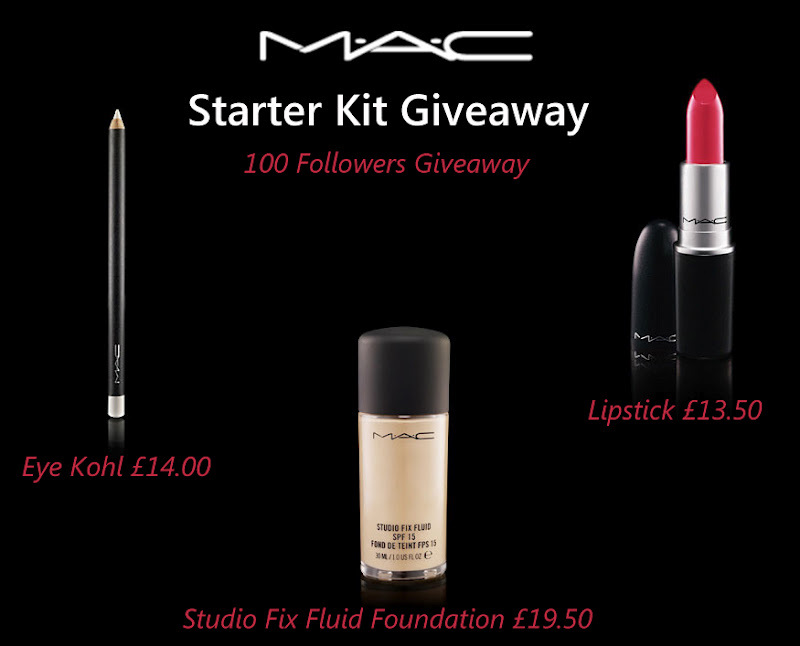 So, for my giveaway, I will be giving away 3 MAC products to ONE lucky reader: 1 Eye Kohl, 1 Studio Fix Fluid Foundation and 1 Lipstick. All three of these items will come to you in ANY SHADE YOU WANT. So, If you win, you can pop down to your local MAC stand and be matched up to a foundation, choose your favourite Kohl colour and your PERFECT lipstick shade. Once I have all the details of your preferences, I will send over all the prizes in your chosen shades to you! The winner will be drawn via random.org number generator on 1st March 2012. 1) Follow me on twitter and tweet: "Have you entered @thisdystopia MAC giveaway yet? http://bit.ly/xys8Ae #bbloggers"
3) FOR 2 EXTRAS ENTRIES you can Blog or Tumblr about my giveaway and link me to your post below. Please add your extra entries to your comment and leave an email address so I can email you should you win! All giveaway prizes will be purchased with my own money.